Visit the Holguín Natural History Museum and discover the secrets of nature of the region. Located in the beautiful palace where the Spanish Colony used to meet, the rich break society, you will find this wonderful museum which will offer you an view about the Northwestern nature of Cuba. The building, initially opened in 1926, and to which you access through a stairway custodied by two lions, suffered remodelings on its beautiful inside structure, as the enlargement of the ballrooms or the construction of a little nave on the flat roof. The history of this fascinating museum began in 1967 when the professor José García Castañeda requested the place to install on its inside a natural history museum. It was given green light and after a few years of remodelings, the center is opened in 1969. 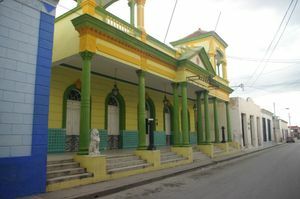 A great amount of the gallery’s fame lays on its inside which hosts important collections coming from the founds of the professor Castañeda and the first museum of Holguín, the Guanamá Museum. Along the tour by the different exhibition rooms, you will enjoy, among others, of the most absorbing exhibitions of malagasy, ornithology, insects, rocks, minerals or even a paleontology collection which exhibits the most perfect fossil found in Cuba. On the one hand, the museum also offers specialized bibliographic services, a taxidermy course, or the children’s areas every Saturdays and Sundays where it is recreated the Natural History, beginning with varied sections and the performance of the duet of Los Rofers. On this visit you will enjoy not just the natural science surrounding the city, but you will access to one of the most important buildings in the Old Colony. History, science and fun complement each other in this fantastic visit addressed to all kinds of publics.